(Newser) – US Secretary of State John Kerry today accused North Korea of a litany of crimes and atrocities while reassuring South Korea of America's "ironclad" security commitments. Kerry blamed North Korea for breaking promises, making threats, and showing "flagrant disregard for international law" by continuing to build its nuclear programs even as it oppressed its own people. He said North Korea's "horrific conduct" must be exposed and vowed to ratchet up pressure on Pyongyang to change its behavior, particularly since it has rebuffed attempts to restart nuclear disarmament negotiations. "They have grown the threat of their program and have acted with a kind of reckless abandon," Kerry said. If a N. Korean kills one of his own, or, an American kills a 12 year old, also one of our own.? 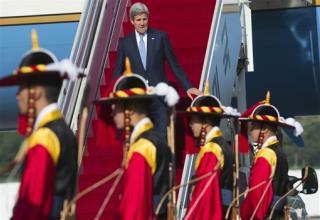 Lurch should be careful, the little korean runt might get offended and shoot him with a bazooka.